I am just watching the Race Day program on Star Sports and 20 minutes to start the race.What a qualification we had yesterday and no F1 giants (Ferraries,McLeraens,Williams, etc) in the front row of the grid. Who would have thought that the old Honda team mates will be in the front row of the grid today.This is the old Honda package with a Mercedes engine in it.Honda will be kicking them selves if they do manage to win this opening race of the season after this performance by the new team Brawn GP.What a start to the new kid on the block. Oh my god , power goes off, will I be able to watch the much waited start of the season. Power is back :) hoorey. How dejected I was. About to start the race, five red lights are illuminated and off they go and hence the race started. Wonderful start by the Jenson Button and poor start by the team mate though. 3 laps to go and started the drama.Jenson Button is the race leader and 3 rd placed Robert Kubica tried to over take Sebastian Vettel and paid the ultimate prize , both crashed into each other and both hit the side wall after damaged to the left front suspension.Safety car was deployed and Sebastian Vettel tried desperately to drive the car through to the pit lane by 3 wheels but to no avail. All these drama fell very well into Rubens Barichello’s hand who was in 4th place before this drama, he finished the race 2nd after his team mate Jenson. 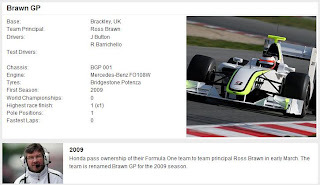 What a start to the new team Brawn GP, and Team Principal Ross Brawn is the man who behind this team and pulled off this stunning performance which finished 1st and 2nd by a rookie team in his first appearance after 1954 French Grand Prix. What a start to the F1 season and what a race to watch on live and I don't have words to explain the entertainment I got today. Who says F1 is boring after this start to the season.Now the question is can the team Brawn continue in the same vein.From what I witness today they will really be a great threat to other front runners.Will keep my fingers crossed on this. I am really looking forward to seen the F1 2009 season with all the changes to the rules and regulations which starts on this Friday with the practice sessions at Albert Park in Melbourne.See this preview. This year, most of the teams have done so many technical changes to their package. One of the new features included into this year was the KERS(Kinetic Energy Recovery Systems). This year it is going to have only 17 races and the Yas Marina Circuit being the new comer will host the final race of the season. 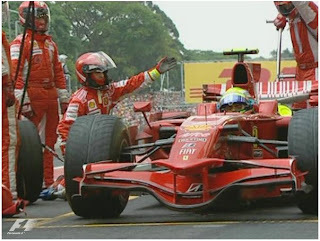 Visit Formula 1 official web site for more information those who are curious about what’s all about this sport. Recently I wanted to enable anonymous access to one of my sites in Share Point.I enabled the anonymous access to the web application from the IIS 7.Unfortunately it didn't work. Then only I started googling on this and found out this wonderful blog post by Sven Gillis. It indeed save my time and sharing with you all too. This is something that I always had in my mind, how to keep your composure ( or cool in another word ) while you are driving.I am pretty clear that we all have come across situations where you totally get frustrated while driving with those totally out of mind drivers.The "frustration" is not the ideal word to show you how badly you felt it, "p..... off" is the right phrase I feel.Sorry for being very offensive. Who are the notorious drivers in our country? Number one is the bus drivers, and two , 3 wheeler drivers and at last but not the least, motorcyclists in my opinion. Out of those, bus drivers are the most insane.Totally out mind , bunch of idiots who has taken the responsibility of taking commuters to their destination.Who would have wanted to be on board with such a stupid in control. I know for sure that you don't need any examples of how they drive on the road. So the question is how you keep your cool while driving.Following are the things I have tried out to keep my stress level to a minimum.In a way it worked really well for me. Don't ever try to retaliate if the driver in front of you do something stupid while you are driving.That is the cardinal mistake you could have done.I know your adrenalin is pumping and you are furious to over take that bugger and learn a lesson to him.By doing this you will be putting yourself in greater danger, because you are not focusing on your driving and you are just thinking about learning a lesson to that idiot.I have experienced that and I know how was it like. Let pedestrians to cross over when ever you have the chance to do so.That will really cool you down for a few seconds and let you gather your breath.That doesn't mean that you have to do it all the time.But I have few situations where you can , let them go by. if you are not in that much of a hurry just put on breaks and let them cross. if there is a long queue behind you then just stop and let them cross, because they (pedestrians) don't have to wait for a long time to cross.Otherwise just keep on going because they can cross after you pass the crossing. Don't ever be restless while you are driving.I know you are in a hurry to go to office or any other work then you are trying to over take others.Then of course you in hot seat.So be patient and take you time to over take. Never ever try to overtake at bends.I have done so couple of times and avoided some close shaves. Try to avoid honking your horn like a crazy.I know for sure you have experienced the driver behind you is honking like a crazy, no need to explain what is your feeling at that time.So it is the same feeling the driver in front of you get if you do the same.So try to use it less and see.Of course you have to use your horn in situations where you have to let the others know about your presence. I know, you readers also have different styles of driving.And I would like to know about those and reactions to what I have mentioned here.